When I first came to England, I didn’t understand what a flapjack was. I thought of it as a down-home-American word for a pancake. Even once I understood what a flapjack was in England, I didn’t get for a long time what all the fuss was about (the English LOVE their flapjacks). As far as I can tell, the classic British flapjack is essentially a very sweet and buttery granola bar without all the good stuff associated with granola bars, other than oats. Little by little, however, I have come to see the potential of the British flapjack. 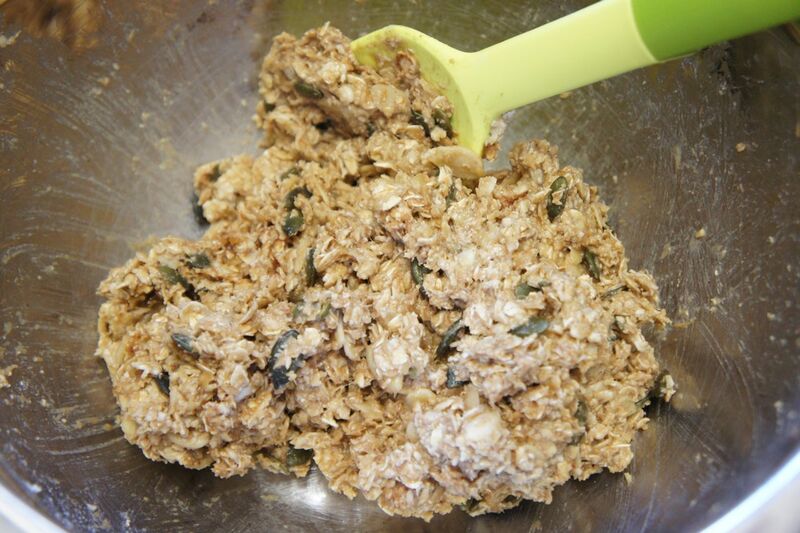 Oat bars are almost a blank canvas, to which you can add any number of ingredients and still bake up a tasty treat. After considerable experimentation, I’ve come up with a version that’s really quite healthy. 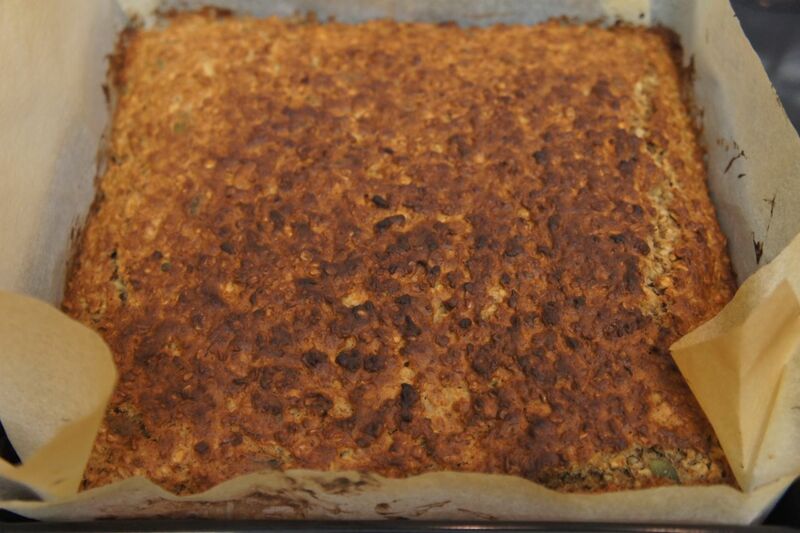 My flapjacks are much lower in sugar and fat than the classic flapjack. They’re gluten-free and dairy-free – in fact, vegan. For added nutrition, I add a lot of nuts. Lots of banana keeps my flapjacks moist and sweet. For a quick and easy everyday snack, that’s where I stop. 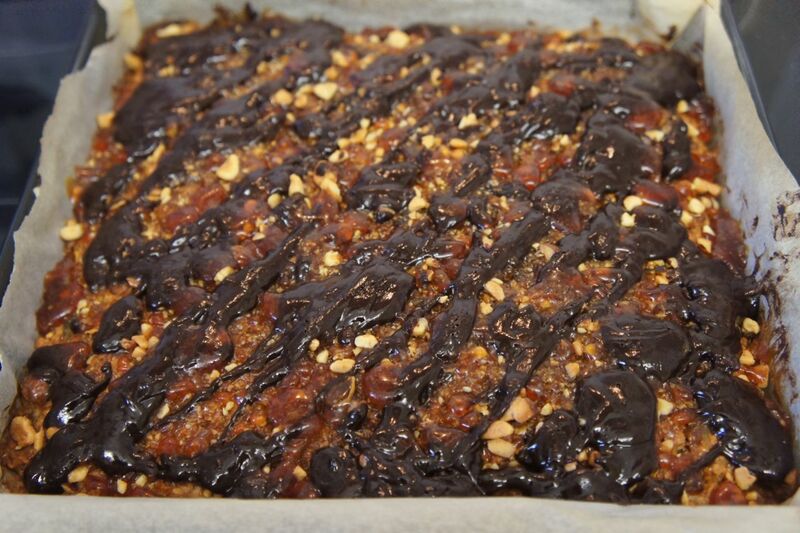 However, for a more decadent treat or to serve to guests, I like to add chocolate drizzle and hazelnut toffee crunch. 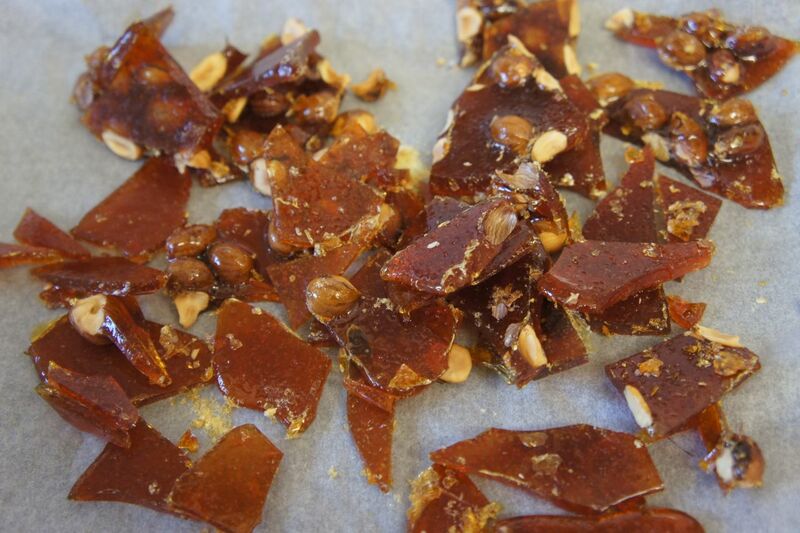 Preheat oven to at 175 C/ 350 F.
In a large bowl, combine all ingredients except hazelnut toffee crunch ingredients. Mix well. Dump everything into a square baking pan (I think mine is 9×9) lined with non-stick baking paper. With moist hands, press everything firmly into the pan until it’s flat. Bake until top is golden brown, about 25 minutes. Optionally top with hazelnut toffee crunch and chocolate drizzle. Ooh, yeah! The quantities given below make enough hazelnut toffee crunch to top two pans of flapjacks generously, maybe three less generously. 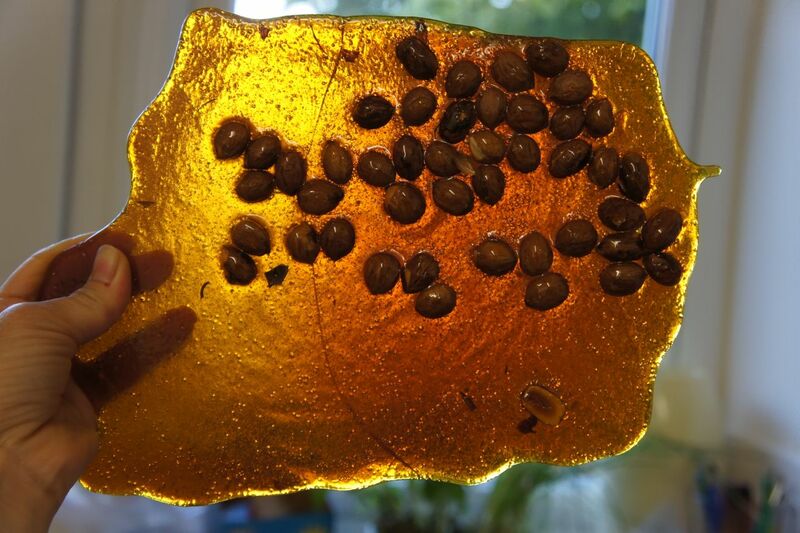 Next time I’ll halve the quantity because brittles like this tend to soften over time, but because the pictures were taken with the quantities given, that’s what I’m providing here. Prepare a cookie sheet by simply placing a piece of non-stick baking paper on it. 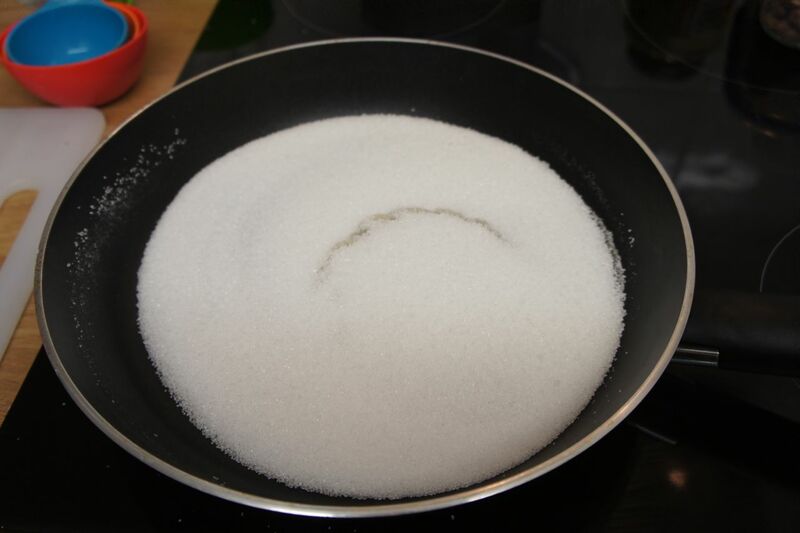 Put the sugar in a non-stick frying pan over high heat. Don’t add water or anything else! 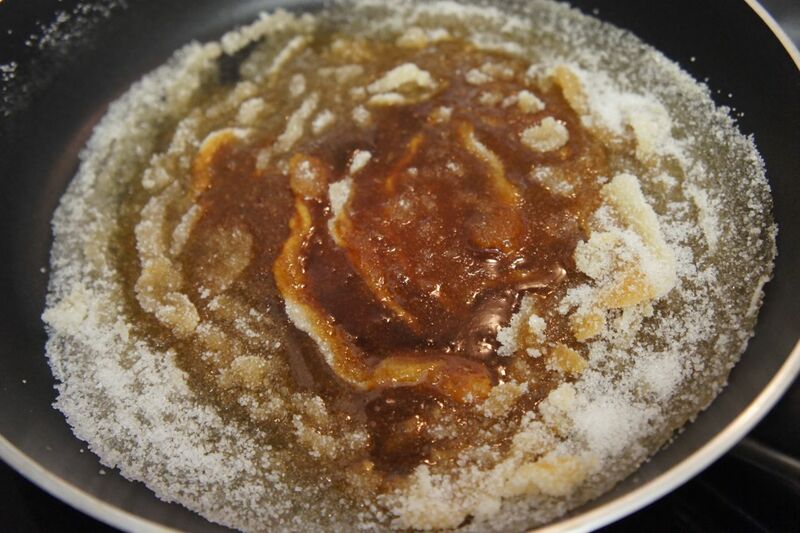 When the sugar starts to melt, shake it around and, once more of it gets melted, alternate shaking and swirling to ensure all the sugar gets melted and caramelized. Avoid using a spoon if you can help yourself. This process needs to be monitored constantly – no multitasking! One the sugar is a nice golden brown colour, add the hazelnuts. 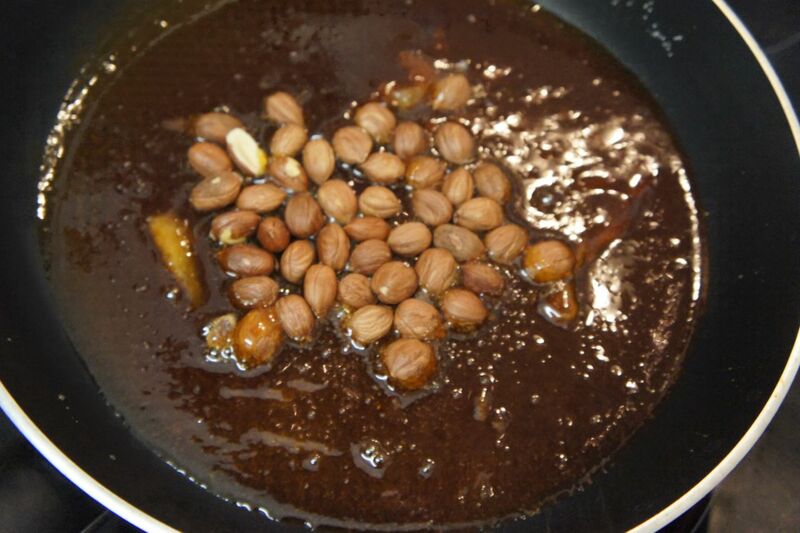 Swirl around until the hazelnuts are thoroughly coated in the melted sugar. 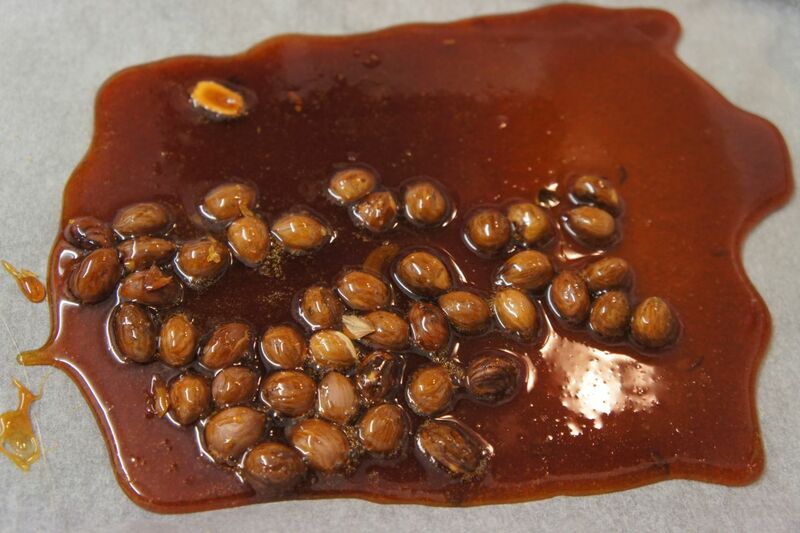 Pour the sugar-hazelnut mixture onto the non-stick baking paper. Set aside until cool and hard — you should be able to peel off the baking paper and wave it around if you feel so inclined. Roughly break up the piece of hazelnut brittle. 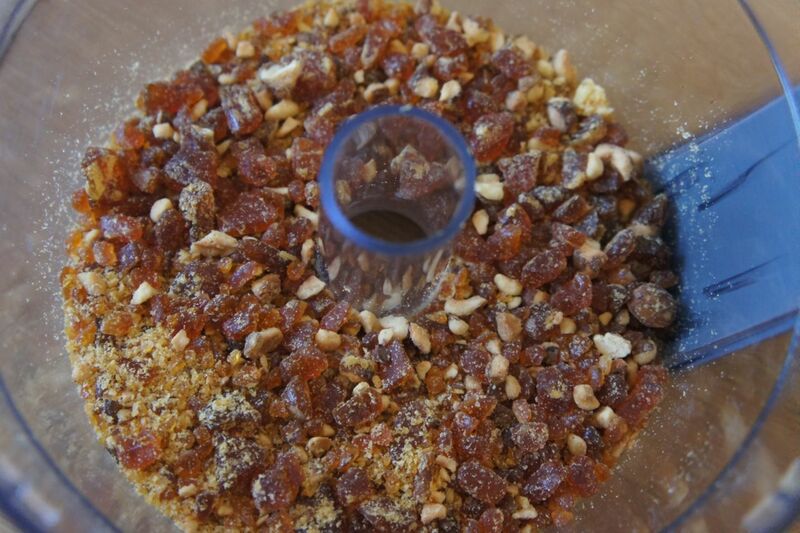 Pulse in food processor until you get small pieces of nuts and toffee. 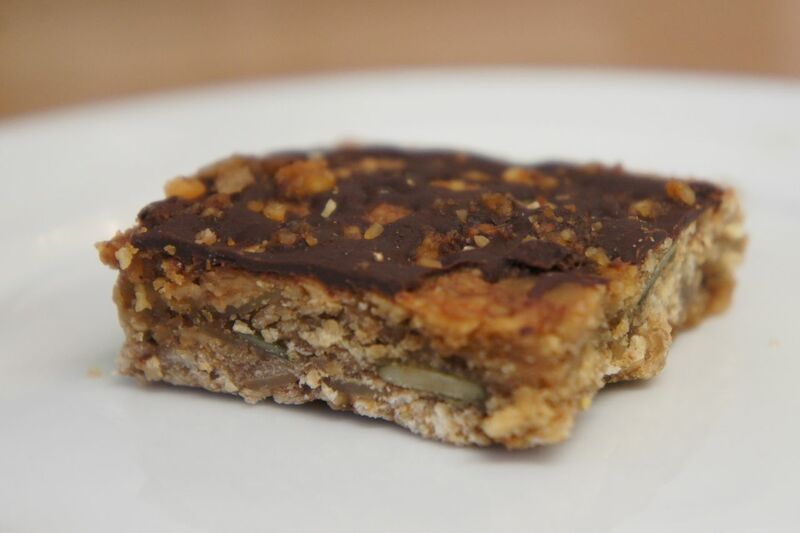 Sprinkle generously on cool pan of flapjacks and drizzle with melted chocolate. 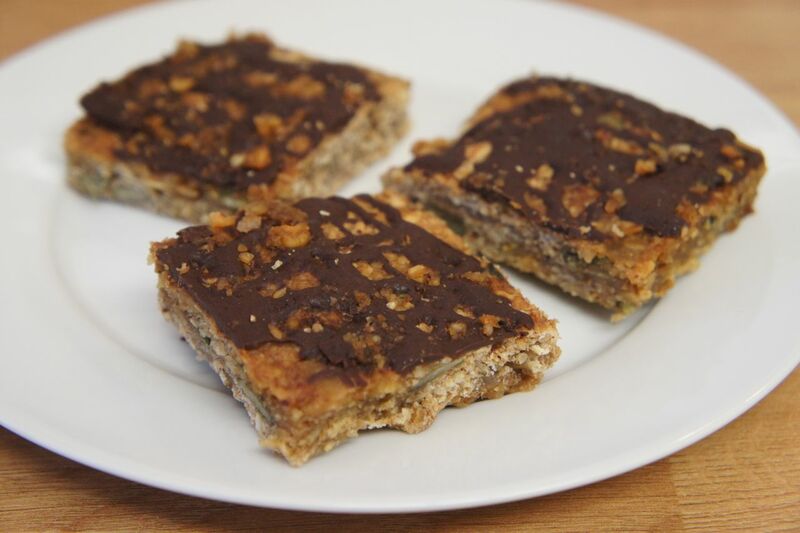 This entry was posted in Baking, Dairy-free, Dessert, European food, Grains, Snacks, Vegan, Vegetarian and tagged banana, bars, brittle, candy, crunch, dairy-free, easy, flapjacks, gluten-free, granola, hazelnut, healthy, low-FODMAP, nuts, oats, toffee, vegan by karenyk. Bookmark the permalink.